Bubbles, Buttons and Bows: A Decoart Tray to Brighten Your Day! 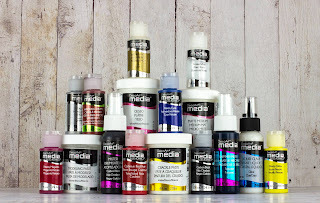 This month at Creative Artiste Mixed Media Challenge we have a fabulous new sponsor DECOART a company with a huge range of products for mixed media artists. 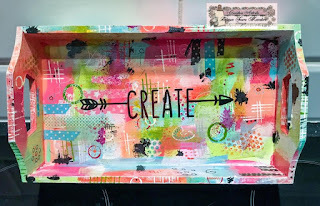 I was really delighted to be able to use my Decoart stash for this project and boy did I use a lot of it! I began by using Decoart gesso to cover a wooden tray. I then used Decoart Fluid media Acrylic paints to cover it in patches. I knocked this back with Decoart tinting base and then added more colour on top. I stenciled through punchinella with more paint to add patches of dots. I then began mark making using a credit card and different sizes of lids, which were dipped in the paint. I added washi tape and pen marks and doodles in both black and white pen and also Decoart Metallic paint and glitter paint. I sprayed Decoart Shimmer Mists in pink and yellow and then finished with drips of carbon black fluid media paint. The techniques were ones that a learnt at a Kate Crane Workshop at the Ministry of Mixology! When I had finished I sprayed the whole thing with Decoart Americana Varnish and added a black vinyl decal which I cut on my Silhouette Cameo machine. 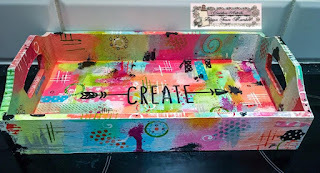 I am using the tray to store my Decoart Glitter paints! 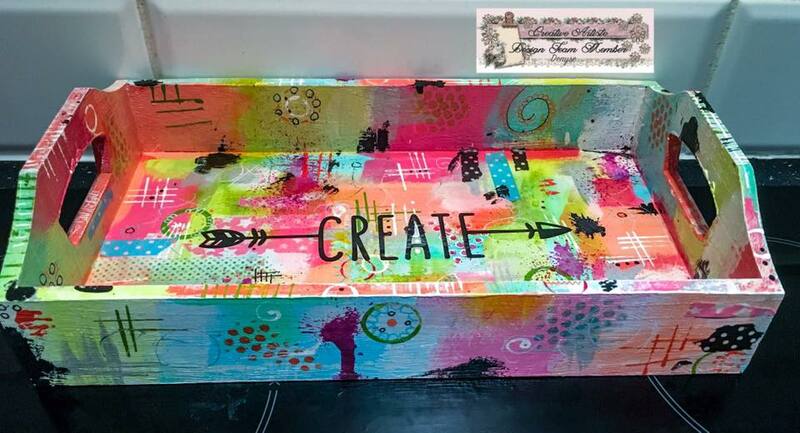 Sure this tray gives the energy to create! I love the bright colours and the combination of all. WOW! What a fabulous project! Beautiful job! Thanks so much for joining in the fun at our Double D ‘Neon / Brights’ challenge! We hope you’ll come back often. Oh wow you have done a brilliant job with this project. Looks sensational. Love it. Fabulous project, such pretty colours and useful too. Beautiful work, so pretty and bright. Thank you for joining us at Altered Eclectics. 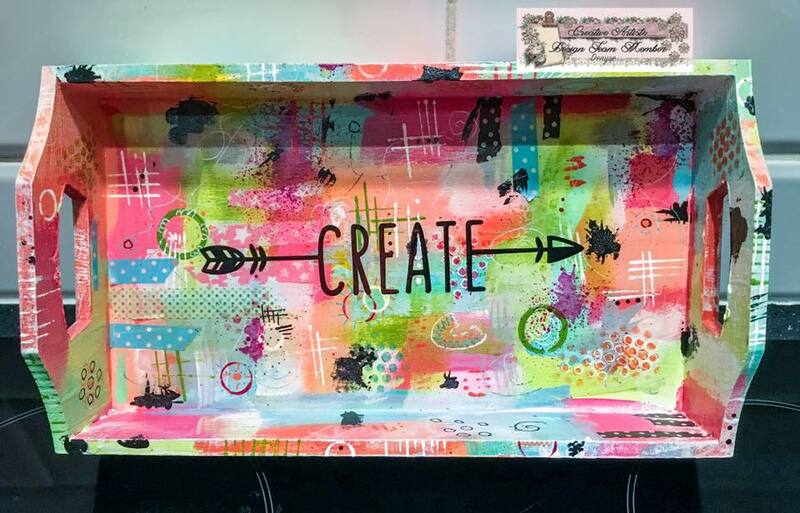 What a fabulous project and I love the tray! Thank you so much for playing along at Double D!! Fabulous tray! I love the bold, cheerful colors, and the fact that it is useful makes it even that much more special! Beasutiful and so vibrant and cheerful.Thank you for sharing with us over at Rhedd's Creative Spirit this month and hope to see you again in future challenges. Happy and beautiful...such a fun make.Thank you for joining us at Rhedd's Creative Spirit this month.